If you are a Rush fan, these last couple of years have brought you many visual documents of their live shows. This particular set goes back to a time when VHS tapes ruled the world. What you get on offer here are the DVD versions of Exit…Stage Left, Grace Under Pressure Tour, and A Show Of Hands videos. Aside from the fact that these are available for the first time on DVD, you also get an unreleased soundtrack CD of the Grace Under Pressure DVD. Now, for those of you who are new to these concerts, let me give you a bit of information so you won't be surprised when you bring this set home. First of all, none of these are full concerts. Rush In Rio and R30 gave you the full show but these only give you most of the concerts. For reasons unknown, they were never issued as full performances. Maybe the production costs had something to do with it. Also, aside from the Grace Under Pressure CD (included in this set), the DVD's are different to their counterpart CD's; especially in the case of Exit…Stage Left. The Exit…Stage Left DVD is the most visually different from all of the other Rush DVD's. Much like the CD, it has less of a concert atmosphere and more of a "collection of live songs" feel. I saw this tour in person and this DVD is about half of the show but it is a great representation of where Rush were at at the time. Gone were the kimonos and long prog tunes and in their place was a sleeker, more modern Rush. The Grace Under Pressure show is my least favorite of the shows in this set. Don't get me wrong, it's a great show and the music is top notch; it's just that visually, this one did not age well. It has a very 80's video look as opposed to film. Watch all 3 shows in a row and you'll see what I mean. But that being said, having a visual documentation of the "Fear" trilogy is worth the cost of the set alone. The A Show Of Hands DVD is very close to the CD of the same name. It was filmed in 1988 on the Hold Your Fire tour and comes closest to featuring the complete performance. All of these shows have been out of print for a while so it's nice to finally get them with remastered sound and updated visuals. The price of the set retails for about $40.00. For that price you not only get 3 DVDs and a CD, you also get 3 mini replicas of the tourbooks from those tours. 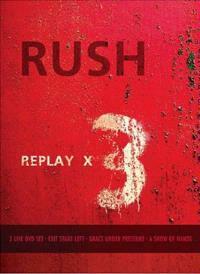 If you purchase Rush Replay X 3 through Best Buy, you also get an additional 4 songs on the Grace Under Pressure tour CD. These bonus track are additional live songs but not from that tour. Whether you purchase through Best Buy or not, this set is a great buy and a great addition to your DVD library. 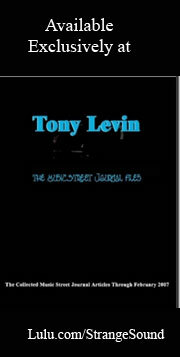 This review is available in book format (hardcover and paperback) in Music Street Journal: 2006 Volume 4 at lulu.com/strangesound.